I specialize in “Edge to Edge” (All-Over) designs. I price my quilting services competitively and provide you with numerous quilting patterns to choose from. There are various methods to choosing the right quilting design for your quilt. It is helpful to know the purpose of the completed quilt so the appropriate design can be selected. JPEG’s of proposed designs may be sent to you for final approval. I’m always open to ideas so feel free to discuss your quilt with me. Many of my long term clients put their trust in my design and thread selection. Edge to Edge (E2E) or often times called All-Over quilting is the most economical quilting service. This is the same design stitched throughout the quilt without regards to the piecing. It is the most common form of longarm quilting and really does give the quilt nice texture without taking away from the fabrics and piecing. Plus there ar e many E2E designs that can make the quilting look custom without the added expense. Quilting special border designs and then quilting an Edge to Edge design in the body. Pricing depends on the number of borders and design. This is another way of keeping the cost down to give the quilt a custom look without the full custom charge. 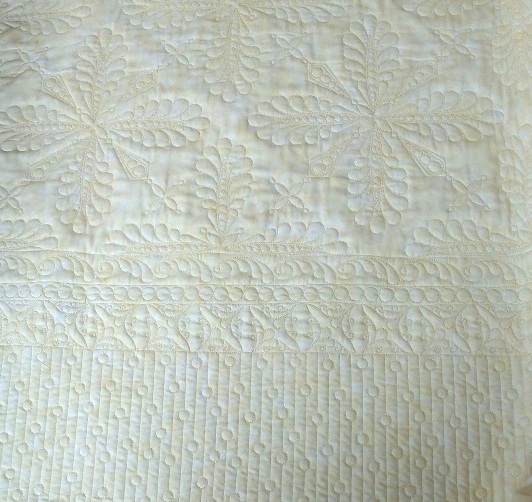 This type of quilting uses a variety of techniques and patterns to highlight the uniqueness of your quilt with light to moderate density. It includes border treatment as well as motifs. Custom quilting is very labor intensive. Completion times vary with the complexity of the designs. Heirloom quilting is a more dense and intricate quilting design than custom. A variety of techniques are used including stitch in the ditch, detailed background fillers, and motifs that enhance the individual block and details of the pieced top. This also includes multiple border treatments. It is a very time consuming process and therefore priced according to the amount of time spent on the quilt. This is priced per project since much time is spent in the design segment of the quilting process.